Almost a hundred thousand people took the streets in the North’s biggest protest against austerity cuts on Friday as Sinn Fein battled accusations that it has let down working class voters and the poor in the negotiation of the Stormont House Agreement. Sinn Fein and the DUP held crisis talks this week with British Direct Ruler Theresa Villiers following Sinn Fein’s decision to withdraw support from welfare cuts legislation, just hours before a final assembly debate on Monday. The British government has insisted on the cuts to the North’s welfare system, and that no further funds are available. Without agreement on the British block grant, the Executive cannot balance its books and will fall back into full Direct Rule. Deputy First Minister Sinn Fein’s Martin McGuinness has said an injection of hundreds of millions of pounds is required, and that the British government are ultimately responsible for the Executive’s problems. “They are, by their agenda, effectively crucifying this Executive and making life very difficult for us to resolve these problems,” he said. The British government described Sinn Fein’s change of stance on welfare as disappointing. “The implementation of these matters is never easy but it is time to get this matter resolved,” said Britain’s Direct Ruler in the North, Theresa Villiers. But she said she does not believe the devolved institutions are at the point of collapse. 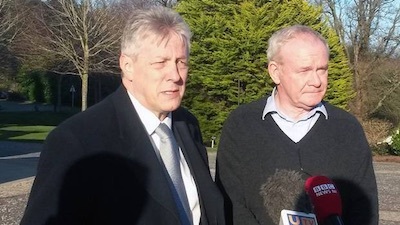 A planned meeting with President Barack Obama in Washington on St Patrick’s Day by Mr McGuinness and DUP First Minister Peter Robinson is now uncertain, however. The row centres on whether the Stormont House Agreement, reached on December 23, contains enough funding to support Sinn Fein’s expectation that there is no need to cut benefits for welfare claimants into the future. Just hours after its Ard Fheis [annual conference] had heard glowing accounts of the Stormont negotiations, Sinn Fein dramatically pulled its support. It claimed the DUP had acted in bad faith by proposing to limit the schemes to current claimants only and had “avoided any engagement” with the party’s efforts to resolve the matter. “Martin made it clear in his Ard Fheis remarks that the matters involved were red line issues for Sinn Fein,” said Sinn Fein leader Gerry Adams. The SDLP this week agreed to sign a ‘petition of concern’ brought by Sinn Fein, a device which allows Stormont’s nationalists to prevent measures being forced into law by the unionist majority. The shock manoeuvre meant that a bill which would have made cuts to welfare benefits inevitable was blocked at the last minute. Robinson accused Sinn Fein of acting in a “ham-fisted” manner and insisted he was “dumbfounded” by the turn of events. He said the funds required to protect future claimants would cost hundreds of millions of pounds more than that provided for in the agreement with the British government. He pointed to the ‘Stormont Castle Agreement’, a side agreement apparently reached among the Stormont parties on December 19, but which only emerged in recent weeks through an unofficial channel linked to a loyalist publication. A two-page annex to that agreement contains a breakdown of welfare spending, with only twenty million pounds per annum for a supplementary payment fund “to provide support for those who may have suffered financial loss”, a fraction of the sum required for blanket coverage. By comparison, the annual cost of policing the loyalist protest camp at the Twaddell north Belfast interface costs roughly half the amount supplied for the supplementary fund. The DUP ridiculed Sinn Fein’s claims that the budget shortfall was unexpected, and warned that the British government could impose new financial penalties on Stormont. Party leader Peter Robinson said Sinn Fein’s accusations that the DUP had resiled from an agreement was a claim “they cannot stand over”. “The Sinn Fein leadership should accept responsibility for failing in their negotiations rather than spreading misinformation about my party and the civil servants in the Department for Social Development who impartially supplied us both the figures upon which the agreement is based,” he said. In response, Sinn Fein pointed to the “indicative” nature of the figures in the agreement. They argued that their negotiators only became aware that the funds agreed would not be sufficient to cover future claimants when the DUP Minister for Social Development, Mervyn Storey, issued an opinion recently that it would be impossible to do so. Sinn Fein published a “dossier” of papers, including one penned by Storey that said that providing a system for future claimants was not possible as it would be “too complex”. That proved that the DUP were reneging on a commitment to protect those in need, they said. “The protection of existing and future claimants was the basis on which Sinn Fein endorsed the Welfare Bill,” said MP Conor Murphy. Sinn Fein’s nationalist and republican rivals were also quick to claim the party had been forced into an embarrassing u-turn. “It’s clear that a strong reaction from people on the ground during canvassing and growing pressure from the trade union movement spooked Sinn Fein into finally rejecting the disastrous welfare reform bill,” said Stephen McCourt of the Republican Network for Unity. In a late development, there were claims this weekend that the matter might be resolved quickly, perhaps even in time for St Patrick’s Day. Robinson and surprised many onlookers on Friday by appearing side by side outside Stormont Castle in Belfast to report a degree of progress. Multi-party talks broke up after half an hour with the party representatives due to meet again at the start of next week to examine the figures worked up over the weekend by Stormont officials. Ulster Unionist leader Mike Nesbitt said an “excellent official” in the Department of Social Development should be credited for the progress. The SDLP’s Alban Maginness said he would reserve judgement until the final figures were presented. “We’ve heard things like this before and we will judge this when we have a definite result,” he said. Even if it is resolved, the dispute has come as a very strong warning of the potential for more problems for other issues discussed in even vaguer terms in the Stormont House Agreement, such as flags, parades, symbols, and the legacy of the past. But for now the focus remains strongly on the austerity agenda at Stormont. Friday saw one of the largest public service stoppages in several years, with a estimated 90,000 attending protest rallies against public sector cuts. 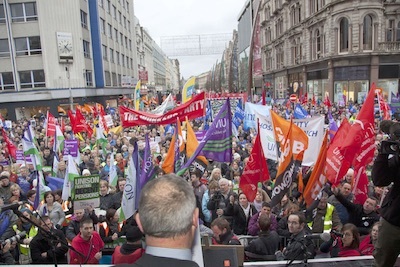 Teachers, nurses, civil servants and transport workers, who had been manning picket lines since the early hours, packed into Belfast city centre to show their opposition to austerity measures. Rallies were also held in Derry, Omagh, Newry, Strabane, Coleraine, Magherafelt, Cookstown, Dungannon and Craigavon. Some 20,000 posts are to be eliminated in a funded redundancy scheme, particularly in the education and health sectors. The public sector cuts look certain to proceed as they are not the subject of the current dispute at Stormont. So it was a tricky day for Sinn Fein’s representatives who, maintaining a low profile, braved a hostile reception at the marches. Conor Murphy, who took part in the Belfast march, denied claims he was protesting against his own actions and those of his colleagues. “I think the strike is about much more than that, it is about the cuts to public funding which impact on public services and the ideological drive of the government in Westminster to try to cut back on their own deficit by attacking services and the welfare state,” he said.